Bhutan may not be remembered only for trekking, hiking adventures tour. 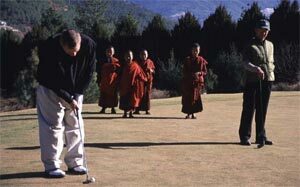 Bhutan is also an ideal destination for golfers. We have some golf courses that provides excellent opportunity to play in the tranquil natural beauty and in the back drop of spectacular Himalayan panorama. Here you have some info about our golf courses and a suggested itinerary for golfing tour in Bhutan. while the lofty Himalayas will be keeping your score, you will feel all the worlds above and below coming together in your golfing experience. Whether you want to learn how to take a tour to Bhutan and play the world's highest course, or if you just want to learn a little about the game in a stunning Himalayan kingdom, this site is for you. Bhutan has seven courses. Four are nine holers Royal Thimphyu (par 34, 2,800 yards), the Wangdi Military Base Course (2,000 yards, par 32 with sand greens), India House (a 2,100-yard layout that is located on the Indian Embassy compound inThimphu and has eight greens and six fairways) and the King's private layout on his property in Punhaka. 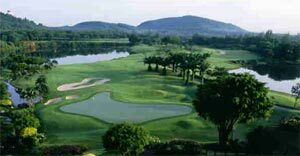 The other three courses range from four to eight holes and are located on military bases. Royal Thimphu is the only course open to the public. An Indian Army officer brought golf to Bhutan in the early 1970s by convincing Bhutan's king to let him build a course on the fallow rice paddies adjacent to the Thimphu dzong. Indian and Bhutanese army officers, and a few high-ranking government officials and businessmen, took up golf in Bhutan during the 1970s. The kingdom's golf population swelled to around 50 in the 1980s, and by the end of the millennium there were nearly 100 golfers, including His Majesty Jigme Singye Wangchuck. There are no pro shops in Bhutan, so players either purchase gear when travelling abroad or they buy used clubs from friends. Children began playing the game when Rick Lipsey, an American, came to Bhutan in 2002 and created the Bhutan Youth Golf Association. Golf came to Bhutan 35 years ago. Then, the Tashichhodzong, a sprawling fortlike structure with offices for the country's key government and religious officials, was surrounded by putrid rice paddies. An Indian army officer told King Jigme Singye Wangchuck that he could turn the glop into a manicured lawn by building a golf course. The king was unfamiliar with golf, but he liked the idea of a green oasis, and the course opened a few years later. Today, there are similarities and differences between golf in Bhutan and the rest of the world. The biggest differences: the lack of even one motorized cart, and the altitude. In Thimphu (7,500 feet), the ball flies 20 percent farther than at sea level, and yet the course is fairly short at about 5,500 yards and par 66 from the two sets of tees used for an 18-hole round.